In a blender, puree yogurt, bananas and agave. Spoon mixture into four plastic popscicle molds. Place sticks in molds and freeze until firm, about 6-8 hours. Remove popscicles from plastic molds. Place on a parchment-lined baking sheet, return to freezer. Place cereal, strawberries and bananas in a quart-sized ziptop bag. Crush with a wooden rolling pin until coarse crumbs form. Transfer to a large plate or bowl. In a microwave-safe bowl, melt together white chocolate chips and coconut oil, microwaving in 30 second bursts, then stirring until smooth. The mixture should not be hot. 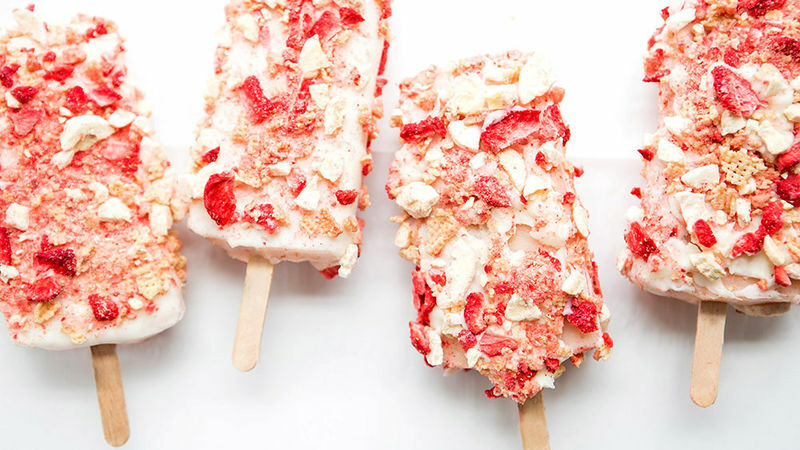 Remove popscicles from the freezer. Working quickly, dip popscicles in white-chocolate mixture then coat with the cereal mixture. Return to baking sheet and freeze until ready to serve.